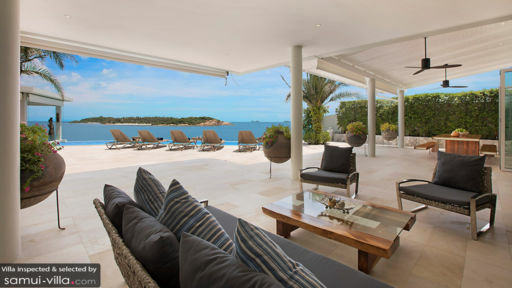 Yo Villa is a three-storey, beachfront vacation residence that embodies contemporary tropical architecture and style. Interiors are appointed with mostly current, swanky furnishings and fixtures accompanied by beautifully crafted woven wood pieces. Amenities are deliberately first rate – to assure each and every guest’s absolute convenience and diversion. Truly, Yo Villa accords you coastal vacation living with an air of sophistication. The villa has four air-conditioned bedrooms. Two of these are on the second floor. Two other bedrooms are on the third floor. All bedrooms have king-sized beds, as well as dedicated bathrooms with free-standing bathtubs and rain showers. The second-floor bedrooms open out to a scenic garden of well-kept lawn. The third-floor bedrooms open out to furnished, covered balconies with breathtaking views of the seascape. Along the edge of the property is the 12-meter infinity pool. Dip into its alluring, crystal clear waters that appears to carry you out to sea. 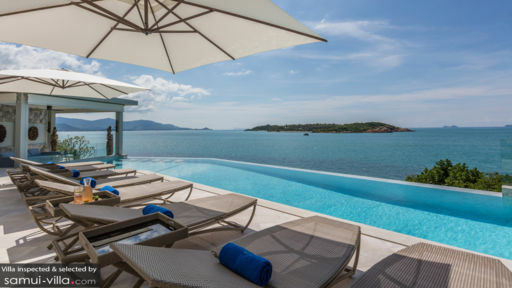 If you wish to bathe, instead, in the sun, you can laze on woven wood pool beds partially covered by large umbrellas on the poolside stone deck. 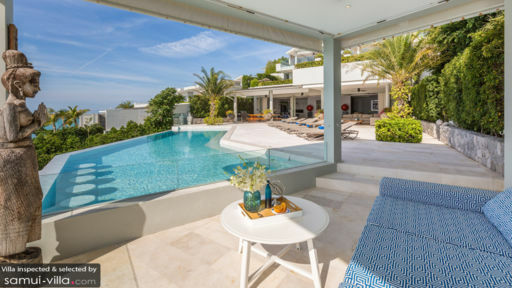 But as soon as the rays begin to burn, retreat to the shade of the contemporized sala at one end of the swimming pool and recline on the hefty couch – entranced – as you gaze out to sea. On the villa’s semi-open, spacious and airy ground floor is the living area with sitting arrangements indoors and on the covered terrace. Here, you can all assemble for amusing and animated sharing and storytelling. Or, to catch shows you’ve been closely following on the wall-mounted, widescreen TV. Just across are two dining areas – the indoor dining area – with its circular table, and the alfresco barbecue dining area with its long, picnic-style, timber wood table. At any of these dining areas, you can all feast on authentic Thai cuisine – as well as your most requested comfort food – concocted by the in-house chef at the well-equipped, modern kitchen just behind the indoor dining area. The kitchen also has a counter which, provided with high chairs, doubles as a bar for breakfast, snacks, coffee and drinks. At the villa’s cinema room, you can all watch, for the nth instance, your all-time favorite classic films on the floor-to-ceiling screen. The villa also has its very own gym complete with cardio machines and free weights – so you can still do your exercise regimen even when you’re away from home. Out on the property’s private beach, you can spend some alone time as you relax on woven wood chairs or on a hammock all shaded by lush tropical plants. Assigned to attend to the villa’s services is a staff headed by a manager supported by a chef, a bartender, a pool attendant as well as housekeepers and security personnel. Yo Villa is based in Plai Laem. Hop aboard a long tail boat and go on an expedition to Koh Som for a beach barbecue picnic. On the way back, dock at Aquapark Samui where you can experience a new kind of water fun. Spend the rest of the day at Chaweng Beach swimming, sunbathing as well as enjoying different water sports. On another day tour, get to play a new kind of sport at the Samui Football Golf Club. Then catch some Muay Thai action at the Petchbuncha Boxing Stadium. On your next day trip, go see a replica of Buddha’s footprint at Wat Khao Hua Jook, the Big Buddha itself, Wat Plai Laem and the mummified monk Luang Pordaeng at Wat Khunaram. Make sure you also get some retail therapy at the Central Festival Samui and, especially on a Friday, at the Fisherman’s Village Walking Street. You also mustn’t miss out on the dazzling nightlife especially at Soi Green Mango. Stayed here for 9 nights it is absolute perfection, if you are looking for top quality this is it, it was a 5 star stay with 5 star facilities, beautiful views excellent rooms it ticked all the boxes. I could not recommend this to highly for people looking to book somewhere idilyc. Anastasia and her staff treated us like royalty and nothing was to much trouble for them, from hiring us a car to a perfect Sunday barbecue. We will return to this little piece of paradise.